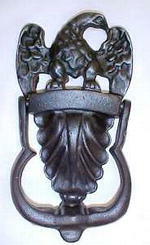 Offering this wonderful vintage Wilton cast iron eagle door knocker. Large eagle with his wings spread and head turned sideways sets on a plaque for engraving with large acanthus leaf underneath. Measures 7 1/2 inches long, good++ condition, no cracks or rust. Signed on back Wilton. A very handsome and patriotic!